The Electric Association Annual Conference and Trade Show gives companies the opportunity to display the latest products, services, and innovations to a captive audience of industry professionals. Companies that design, manufacturer or sell products or technologies to the construction industry should exhibit in this event. This year, attendance will exceed 600 professionals from the region. Increase your sales potential by customizing your booth! Thank you for allowing Midwest Conference Service the opportunity to serve as your provider for a successful trade show! In this email, you will find a URL Link to an Exhibitor Kit for your upcoming show. This is created to make it easy to order anything you need to customize your booth to make it stand out during the show. This Exhibitor Kit also includes details specific to your trade show such as the show schedule, venue information and freight management. 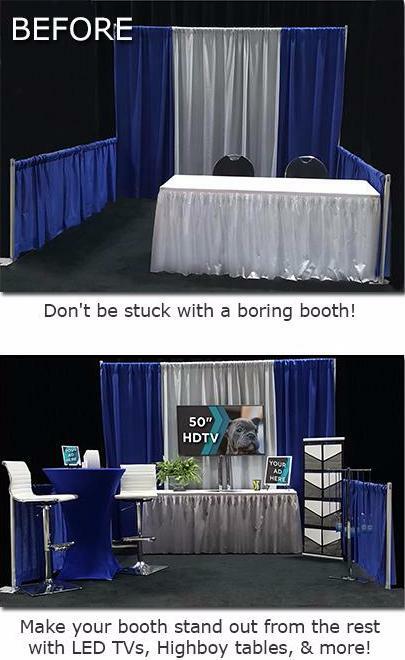 Please feel free to browse our website to obtain more information on rental, audio visual, and graphics/signage options that will enhance your booth or check out our Facebook page for unforgettable ideas, recent show pictures and customer testimonials. To start customizing your booth, just sign up and start ordering! If the orders are placed by the discount deadline that is in the kit, you will automatically get a discounted rate for our services. Payments can be made via Credit Card through the Kit for a fast and easy checkout. If you choose to pay via check, please send a copy of the check to info@mcsexpo.com so we can mark the order paid. Your order will not be processed until a credit card is on file or a check has been received. Please do not ship directly to the show site. Exhibitors must use the advanced warehousing provided by MCS and is further explained in the link below. Click here to go to the Exhibitor Kit! We look forward to working with you. Please feel free to contact us if you have any questions or require more information.